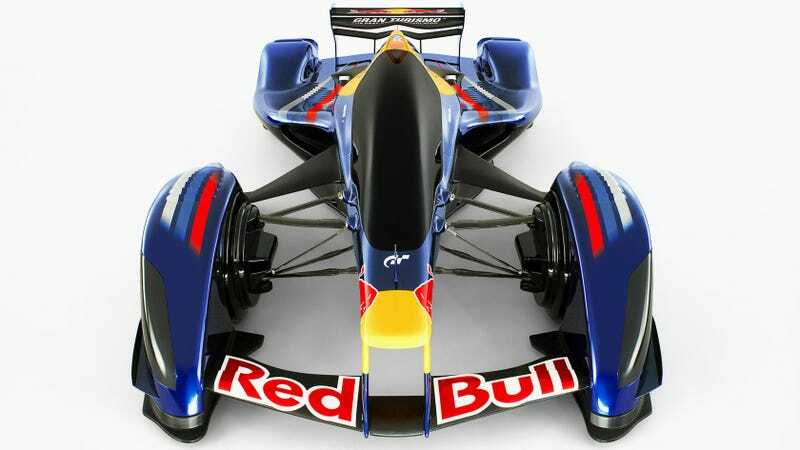 The Red Bull x2010 from Gran Turismo, which could preview this thing. Earlier this year Aston Martin and Red Bull announced a Formula One partnership, and with it a new F1-inspired hypercar for the road designed by ace racing engineer Adrian Newey. Everything else about the car is a secret—until now, thanks to a tipster in the know who claims a lightweight 1,000 horsepower beast is on the way. Here’s what we’ve heard. According to a tip sent to Jalopnik by an individual who attended an owner’s track day for the new Aston Martin Vulcan at Road Atlanta last week, a company executive showed off a design book of images and details about the new Newey-designed car, known publicly as AM-RB 001, to owners in attendance. As with any car rumors, take these with a grain of salt, but our tipster swears by them. The new hypercar is said to weigh around 2,300 pounds with a body designed with “a massive amount of negative space” and no wings or spoilers. I wonder if that means it will be able to slip under the toll booth boom barrier? The underside of the car was described as featuring F1-inspired “venturi channels” flowing to an “upside-down jigsaw wing” that pulls the car down with air flowing in through a recognizable Aston Martin designed mouth. Again, all without the help of any tails or fins up top, because downforce is good and it’s cooler if you can’t see how it’s happening. Our tipster described a surprisingly large interior with tandem seating with the driver and passenger “as close as they can get” (that doesn’t sound very large) and slightly angled in a v-shape with the point at the feet. The rest of the car was said to feature typical Aston Martin design cues with side-exit exhaust leading the very edge of the back of the car, which was presented in British Racing Green. The best, most important green and fitting for what we’re working with. Our tipster compared the car to the Caparo T1, another F1-inspired design featuring a lot of negative space, except with most of the aero-work filling more of the the underside of the body. Apparently the owners at the Road Atlanta event where the upcoming car was briefly displayed were being encouraged to buy the Vulcan and other Aston models to secure themselves one of reportedly 99 models of the AM-RB 001 to be produced for sale. If Ferrari has taught us anything, it’s that you have to buy three cars at full price to get to the one you really want. Aston Martin confirmed to Jalopnik that the owner’s drive with the Vulcan did take place at Road Atlanta but declined to comment on the details provided by our tipster. The car described to us sounds extremely similar to Adrian Newey’s other F1-inspired Red Bull designs, starting with the x2010, also known as the Red Bull X1, which appeared as a virtual car in Gran Turismo 5 and 6. So it sort of counts. The virtual Red Bull x2010 was proclaimed to be the fastest road car ever, even though it never actually existed in the real world, with a claimed top speed of 292 mph and an engine producing a virtual 1,749 horsepower—which is either a lot or nothing at all. It’s kind of messing me up thinking about it. Later versions of the car in 2011 and 2014 increased the top speed and added some additional wings and fans. Some cars even featured a gas turbine engine. They were significantly lighter than the V12 Aston Martin we’ve been tipped off about, but I have little doubt these virtual concepts were Newey’s starting point for the upcoming partner car with Red Bull. A report from CarBuzz suggests a summer reveal for the new hypercar, with an owner corroborating our tipster’s claims that some owners have been presented with the new car’s design and have even been given the opportunity to place an order. They claim that all 99 cars have been sold for around $3.2 million each, which is about $3.195 million more than I can afford.